BRTC Job Circular 2019 found here. Bangladesh Road Transport Corporation Job Circular BRTC Job Cicular 2019. Bangladesh Road Transport Corporation BRTC Job Circular 2019 Latest job found here. 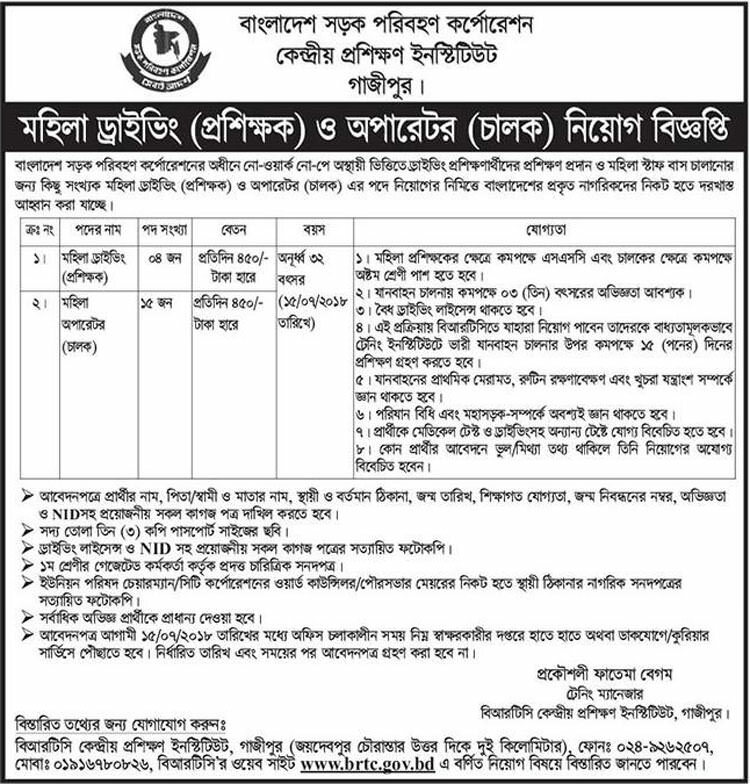 Bangladesh Road Transport Corporation will recruit vacancies for Various Posts for the year 2019. 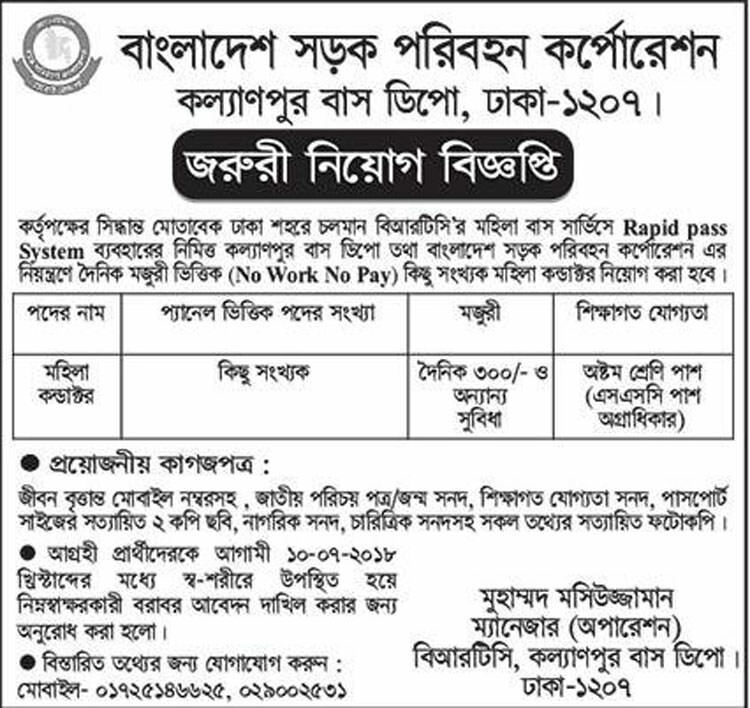 Bangladesh Road Transport Corporation BRTC New Job circular 2019 published on different dates (See the Particular Job Circular for Details). Interested and eligible Bangladeshi Citizenship candidates are requested to Apply for the vacant positions. Deadline of Application on different dates (See the Particular Job Circular for Details). Bangladesh Road Transport Corporation BRTC Job Circular 2019. Bangladesh Road Transport Corporation is a Government Transport or Paribahan of Bangladesh. It has many depo in many places in Bangladesh. Established in 1961 under BRTC Ordinance 07, 04 February 1961. Today, BRTC is a diversified Transport Sector in Bangladesh. In line with its business expansion and diversification plan, BRTC now invites applications from highly motivated and talented individuals to fill up the following positions. If you are interested in taking this challenge, then please ‘Apply‘ in physical presence with all attested information of National NID, Character Crtificate, Birtth Certifgicate, Education Certificate, 2 copies pass port size Photo for the vacant positions. Deadline of Online Application on different dates (See the Particular Job Circular for Details). You may also apply by www.brtc.gov.bd by mentioning the position you are applying for. Deadline for Online Application is: See the particular job circular for details. Or find Head of Human Resources, Bangladesh Road Transport Corporation. Paribahan Bhaban, 21 Rajuk Avenue, Dhaka-1000, Bangladesh. Web : www.brtc.gov.bd Business : Paribahan/Transport.